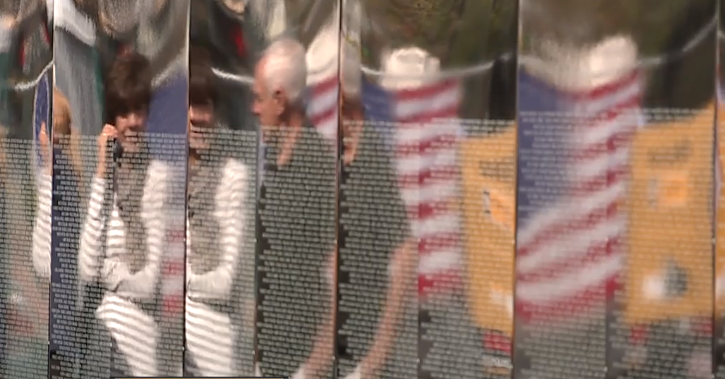 The Vietnam Veterans Memorial moving wall is a half-sized replica of the memorial wall in Washington D.C. and it was on display in Las Vegas. It was showcased near the Nevada Supreme Court building in downtown since Nov. 1. On display were more than 58,000 names - an entire generation of men and women who answered the call to serve more than 60 years ago. Those still alive to share their stories were in search of the ones they once knew. “Colonel Vogel is on this panel here somewhere,” Vietnam veteran Vaughn Binzer said, as he was looking for his fellow comrades' name. "He was a jolly fella and a good commander who was an excellent artilleryman," said Binzer. The traveling wall brought the same honor and emotions just like the real memorial at the nation’s capital. "Some 31 of them are people I knew, served with, friends of mine. They stood up for the country whether they believed in the political message at the time," said Binzer. Among those etchings are Hazel and Jacob. "I came to visit my brother Larry James. I wanted my grandson to see that he was in the Vietnam War." Jacob said. Hazel hasn’t been able to make a trip to visit the wall in D.C. but felt blessed that the replica wall came to her hometown. "I cried a little bit when I was here because it was like I was visiting his grave," Hazel said. For other veterans, the traveling wall is also about keeping war history alive. "It's a good educational vehicle for people in school," said Binzer. The wall was on display for the first time in Southern Nevada.